Think Mauritius and your mind instantly conjures up images of powder white beaches and tropical palm trees. However, the country isn't just about beaches. If you can tear yourself away from the exotic sands for just sometime; Mauritius tourism has a ton of activities, historical sights, and lush forests to offer to the romantic honeymooners. The tropical gem can be best explored with the Mauritius tour packages. Discover the beauty of Belle Mare Plage beach and enjoy a great sunrise, go snorkelling at the Ile Aux Cerfs beach or explore the beautiful Trou Aux Cerfs volcano. Need more information on for Mauritius honeymoon packages, call SOTC today. One of the best places to visit in Mauritius is Port Louis, the bustling capital, which boasts of French colonial architecture and offers exciting shopping and entertainment venues. Grand Baie is also one of the popular tourist places in Mauritius. Not to miss is the Black River Gorges National Park, which is spread across a massive area and is a perfect honeymoon place for a romantic time amidst the beauty of nature. Another interesting spot is Chamarel- a village located in the district of Black River where you can see a dune with seven different colours. The dunes are also acknowledged as the 'Seven Colored Earth'. Honeymoon in Mauritius is incomplete without a visit to this charming place. Mauritius tour packages offer a great honeymoon experience to these stunning gems of this tiny island. Expect some of Africa's best beaches, fresh seafood and long, sun-drenched days on a Mauritius holiday. Home to some of the most luxurious hotels and resorts in the world, Mauritius is a perfect setting for a memorable honeymoon. These resorts offer you great luxury and complete privacy to you and your beloved, for some great moments of togetherness, with Mauritius honeymoon packages. Explore some of the most interesting things to do in Mauritius with SOTC Holidays. The best time to visit Mauritius is from May to December when the weather is cool, dry and sunny. The island has a classic tropical climate with warm weather year-round. 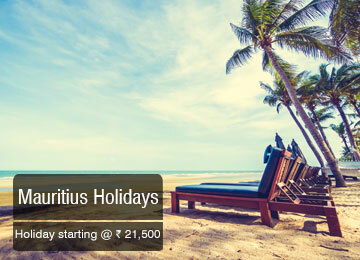 Explore the tiny tropical paradise with excellent Mauritius packages. Browse through our other international honeymoon packages for wonderful memories! Discover magic in the Himalayan kingdom of Nepal, enjoy great moments of togetherness at the best beaches of Maldives or go shopping in the bustling Kuala Lumpur. Explore these wonderful destinations with SOTC’s excellent honeymoon packages. Also, browse through our exclusive International tour packages to explore the best places around the globe! Carry ample sunscreen, umbrellas and sun protection accessories as it is always hot and sunny here. Don’t miss the delicious seafood. It’s fresh and very tasty. Water sports in Mauritius are unmissable. Snorkelling, diving or surfing on the beautiful beaches will make your honeymoon very memorable. Move away from the beaches and you get extremely beautiful wildlife and bounty of nature. Hiking or trekking, if you love adventure, is a great option to explore the place.